To make it as easy as possible for your family to play along with Music Together at home and take your Music Together songs anywhere, we have an app! Check out the free “Hello Everybody” app for iPhone or android. It's an easy way for you to access your Music Together songs, whether you are at home or on the go! Log in with your account (or create a new one on the app) and then use the access code inside your Songbook cover to download all your songs. Then, have fun singing and dancing along from wherever you are. 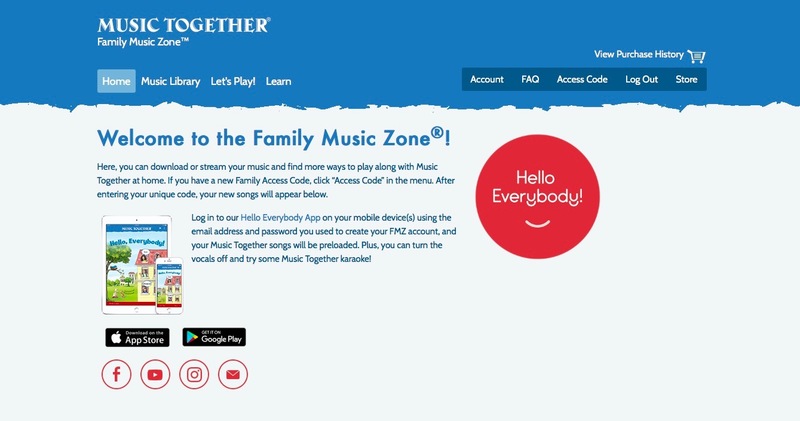 As a member of the global Music Together family, you have access to the Family Zone on the Music Together Worldwide website. Here, you'll be able to download your music, view a digital copy of your songbook, get new activities to try at home, and learn more about your child's music development. To log in, you'll create an account using the code on the inside cover of your songbook. Contact us if you need help!